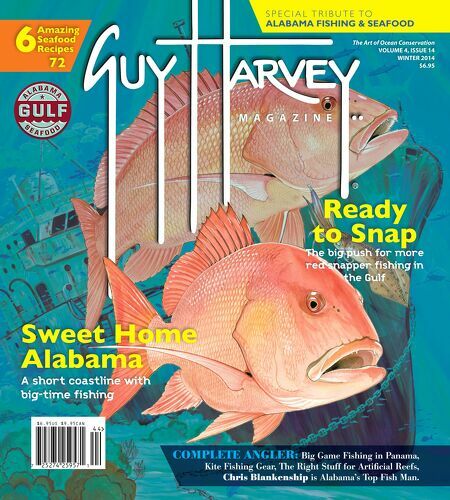 Guy Harvey Magazine is focused on fishing, boating, scuba diving, and marine conservation. Portfolios from the world's best fishing photographers, articles on gear, travel, tournaments, apparel, lifestyle, seafood recipes, sustainable fisheries. 6 S P E C I A L T R I B U T E TO ALABAMA FISHING & SEAFOOD Amazing Seafood Recipes The Art of Ocean Conservation VOLUME 4, ISSUE 14 WINTER 2014 $6.95 72 Ready to Snap The big push for more red snapper fishing in the Gulf Sweet Home Alabama A short coastline with big-time fishing COMPLETE ANGLER: Big Game Fishing in Panama, Kite Fishing Gear, The Right Stuff for Artifcial Reefs, Chris Blankenship is Alabama's Top Fish Man.